Viewing this site or utilizing any Steel Rain, LLC’s (Steel Rain) services is considered unconditional acceptance of these terms and conditions. All applicable Federal, State and local laws and regulations are hereby incorporated into these Terms and Conditions in the same force and manor as if included in full text. These terms and conditions are subject to change at any time without notice. Any updated terms and conditions will be added to this site. Please review the official government sites for the current, applicable US Government, State and local rules and regulations as they change from time to time without notice. You must be eighteen (18) years of age and comply with these Terms and Conditions to view or utilize this site. By continuing to view or use this site, you represent and certify that you meet these requirements. In accordance with the above certification, you are granted a limited, personal, non-exclusive, revocable, non-transferable license to view this site and purchase good or services for yourself only. It may not be used for any third party or for any commercial purposes. This license is immediately revoked for any breach of any of these terms and conditions or for any reason Steel Rain so desires. You agree that all information posted on this site is provided for information only. Steel Rain is not liable for reliance on any of the information posted. Steel Rain is not responsible for information posted by individuals other than Steel Rain management or employees. NO WARRANTY IS PROVIDED INCLUDING, BUT NOT LIMITED TO, WARRANTY OF MERCHANTABILIITY OR FITNESS FOR A PARTICULAR PURPOSE OR ACCURACY. You agree Steel Rain is not responsible for any damage may occur to your equipment as a result of use of this web site. You agree not to: a) attempt to or gain access to this site or any of it’s servers, b) not to reverse engineer this site or any items from this site, c) not to modify any information posted, d) create or transmit any unsolicited electronic communications e) use any software, virus or harmful codes to interfere with the working of this site, servers or any of it’s customers servers f) obtain customer information from this web site, g) post any unlawful, threatening or harassing messages or pictures and h) not use this site to infringe or violate any third party Proprietary information, copyrights, trademarks or patents, i) violate any Government laws or regulations including , but not limited to export regulations or j) insight any unlawful acts. You must be the End User. Purchase for a third party is prohibited without prior approval from Steel Rain. Purchases for an educational, commercial, or government organization may be approved with proper documentation. Please contact us for further information. Steel Rain reserves the right to refuse or terminate orders for goods or services at any time for any reason. Compliance with all US Export Laws and regulations is mandatory. You agree to comply. Note that Government restrictions may apply and approval via a valid export license may be required. Review the Government web site for current export regulations. 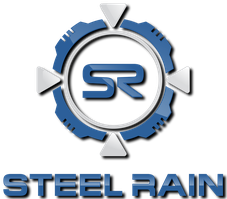 Warranty/Returns Steel Rain, LLC’s warranty with respect to the goods or services purchased from this site is limited to return of the equipment for either repair or price adjustment determined solely by Steel Rain, LLC. STEEL RAIN, LLC HEREBY EXCLUDES AND DISCLAIMS ANY LIABILITY FOR ANY LOSSES AND EXPENCES OF ANY KIND INCLUDING, WITHOUT LIMITATIONS, ANY DIRECT, INDIRECT, GENERAL, SPECIAL, PUNITIVE, INCIDENTAL OR CONSEQUENTIAL DAMAGES, OR LOSS OF ANY KIND ARISING OUT OF OR IN CONNECTION WITH THE USE OF THIS SITE OR ANY MERCHANDISE AVAILABLE ON THIS SITE. THIS LIMITATION OF LIABILITY APPLIES WHETHER THE ALLEGED LIABILITY IS BASED ON CONTRACT, TORT (INCLUDING NEGLEGENCE) STRICT LIABILITY OR ANY OTHER BASIS. IF ANY PART OF THE LIMITATION OF LIABILITY IS FOUND TO BE INVALID OR UNENFORCABLE FOR ANY REASON, THAN THE AGGREGATE LIABILITY ON THE PART OF STEEL RAIN FOR LIABILITIES THAT OTHERWISE WOULD HAVE BEEN LIMITED SHALL NOT EXCEED Ten ($10.00) DOLLARS. You agree to indemnify and hold harmless Steel Rain LLC, it’s management and employees from any liability, loss, expense or demand (including any legal fees) related to the use of this web site and any goods or services available from this web site. Prices for goods and services offered on this web site are subject to change without prior notice. Minimum or maximum order values and quantity limits may also be applied. Steel Rain reserves the right to limit quantities for any reason. Limits may also be applied per order, per account, per person or household. Compliance to these terms and conditions is an integral part of any order. Any breach may result in order termination. This includes, but not limited to, current, accurate and complete information regarding, account information, end user, citizenship, restrictions on possession or receipt of firearms, residency and payment information. All orders are subject to availability of goods. Should goods or services not be available, you will be notified and the order will be terminated. Alternate choices, if available, may be offered for your consideration. Steel Rain reserves the right to make corrections for any obvious web site or order errors. Should an error that affects your order be identified, Steel Rain will contact you and either correct the error and continue or terminate the order. Payments are subject to collection. You agree to provide current, accurate and complete account information. All payments are to be made in US Dollars. Shipping and taxes will be included in the final amount.